Recently, I sat on a plane, connected to “GoGoWireless”, and “IM’d” with my seatmate while we both listened to our favorite music via Bose headphones. So who needs a voice? That experience was in contrast to this one: Later that day, I attended a presentation via Webex, and heard the presenter, but never saw him. It’s amazing how important a voice can be when there is nobody attached to it! Voicemails, phone conversations, and conference calls have propelled our often misused, abused and underrated weapon of self-expression into the limelight, whether we are ready or not. The challenge with this recent elevation of the stature of the voice is that the voice is revelatory in nature. You can’t hide your feelings, your history, your education or your emotional state from others. Your voice without some training, or at least some awareness, is like your computer without a firewall: All your secrets are exposed. The response to this knowledge could easily be fear and a desire to hide behind a delivery that is manufactured and molded to sound a certain, prescribed way. 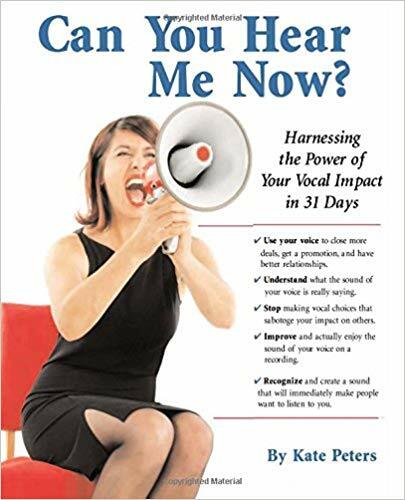 But if there is a prescription for dealing with the fact that your voice is giving you away, it is to embrace the revelatory nature and use your voice with conviction and honesty. You cannot say one thing and mean another in this brave new world. You must be clear, and be aware of how your conversational intent aligns with what you are actually saying. Clarity of intention has a funny way of bringing all the manufactured speech patterns, the affectations, to a screeching halt. With an honest intention, you become an authentic spokesperson for your work, your cause, your family, your team and/or your life. Your delivery becomes genuine rather than plastic, the latter being carefully constructed to bring out only what you want others to perceive. Remember, you cannot hide anyway. Think back to a recent conversation that went very well. What was your intention for the conversation, your goal, the aim that guided your actions? What were you hoping to accomplish? Now think of a conversation that didn’t go so well. What was your intention? Was it honest? Was it clear to you, let alone the other person? Before your next conversation that matters, think through what you are trying to accomplish, who the audience is, and what you have to say to them. Set your intention. Be very honest with yourself. If you think you intend to agree to disagree, but you secretly hope to manipulate them to your point of view, your credibility will suffer and so will your authenticity. You don’t have to tell anyone else, but don’t lie to yourself! The perception of an authentic voice depends on the clear intention that aligns with the message and is honestly connected to the delivery.